With a few notable exceptions, the French efforts on the Somme have been largely missing or minimised in British accounts of the Battle of the Somme. And yet they held this sector of the Front from the outbreak of the war until well into 1915 and, indeed, in parts into 1916\. It does not hurt to be reminded that the French army suffered some 200,000 casualties in the 1916 offensive. 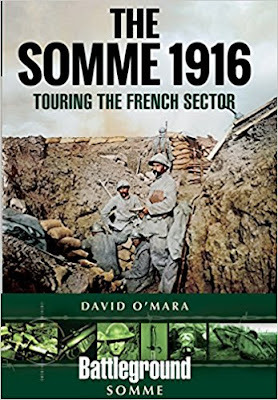 David O Mara s book provides an outline narrative describing the arrival of the war on the Somme and some of the notable and quite fierce actions that took place that autumn and, indeed, into December of 1914. Extensive mine warfare was a feature of 1915 and beyond on the Somme; for example under Redan Ridge and before Dompierre and Fay. The French limited offensive at Serre in June 1915 is reasonably well known, but there was fighting elsewhere for example the Germans launched a short, sharp, limited attack at Frise in January 1916, part of the diversionary action before the Germans launched their ill-fated offensive at Verdun. The book covers the Somme front from Gommecourt, north of the Somme, to Chaulnes, at the southern end of the battle zone of 1916\. The reader is taken around key points in various tours. For many British visitors the battlefields south of the Somme will be a revelation; there is much to see, both of cemeteries and memorials, but also substantial traces of the fighting remain on the ground, some of which is accessible to the public. It has always been something of a disgrace that there is so little available, even in French, to educate the public in an accessible written form about the substantial effort made by France's army on the Somme; this book and subsequent, more detailed volumes to be published in the coming years will go some way to rectify this. British visitors should be fascinated by the story of these forgotten men of France and the largely unknown part of the Somme battlefield.